Whether your photo printer is new or has been collecting dust between the holidays, you’ve likely spent a few frustrating moments setting up the machine. But did you know proper setup can improve the quality of your prints? Spend a few moments looking over the basics, and see why it can be a good idea to keep your drivers updated, learn about some basic printer maintenance, and see some advanced options for setting up great prints. Keep reading! Your operating system may recognize your printer right out of the box, but unless your computer and printer are communicating perfectly, you are likely to not get the best quality print possible. It’s likely your printer came with a drivers CD, although most users lose these within hours of opening the box. If you still have it, using this disc is an acceptable way to install a printer. But if newer drivers exist, minor or even major issues with prints might have been fixed. 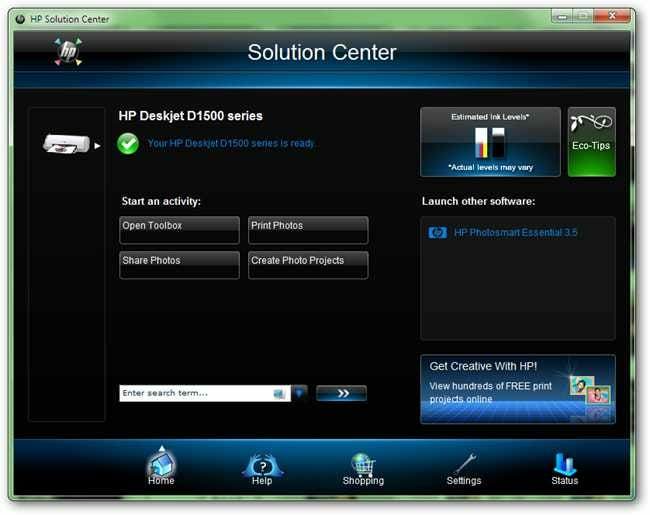 Most major printer manufacturers will provide software and drivers for free downloads. 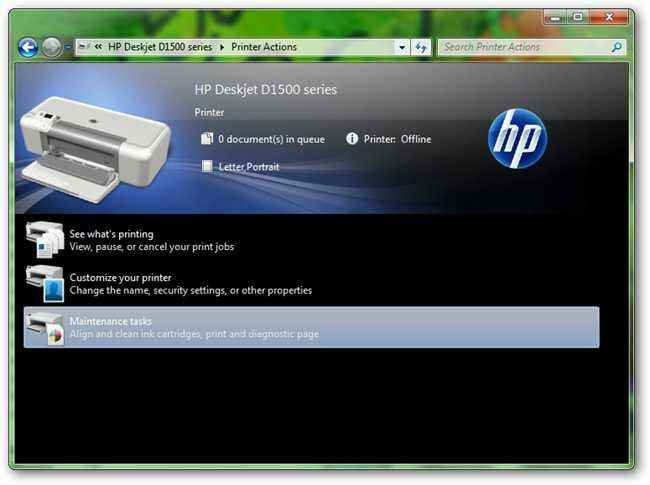 In order to get these, visit the webpage for the brand of printer you are using—Hewlett Packard, Epson, Canon, etc—rather than simply doing Google searches for the device number. There are a number of sites that claim to host drivers, although there is rarely any reason to trust anyone but the manufacturer of your printer for support and Windows driver downloads. 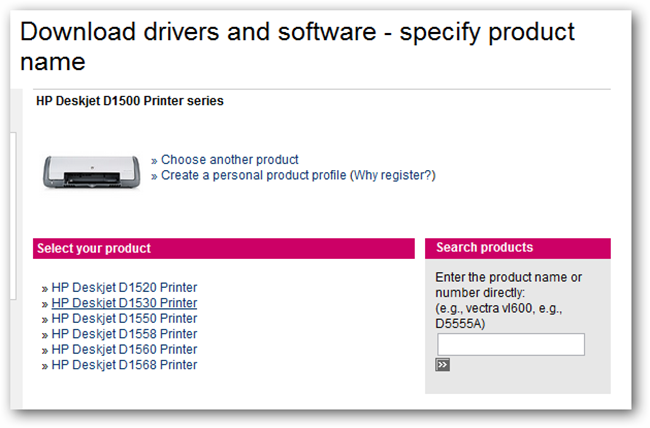 You’ll need to know the exact model number of your printer, usually branded on the front of the unit. In addition to this, you’ll have to know your operating system, which can be oddly specific, as illustrated above. 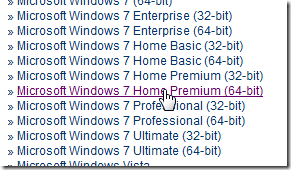 In this case, it is an HP D1530 working with Windows 7 Home Premium. Often drivers on CDs or downloads come bundled with software and helper applications, many of which are not useful and only serve to clog up your system tray. Still, the driver is the important thing, so install it and avoid installing any additional software you do not think will be helpful to you. While you may not be interested in the bonus “Photo Sharing” or print wizards that come bundled with your drivers , nearly every printer comes with a toolkit capable of improving poor print quality from troublesome cartridges. 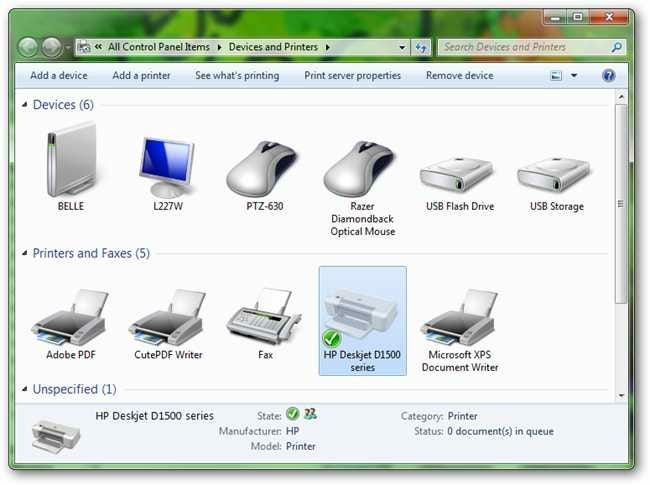 Once your printer is properly installed, bring up your start menu and search for “Devices and Printers.” You can also find it under your Control Panel. 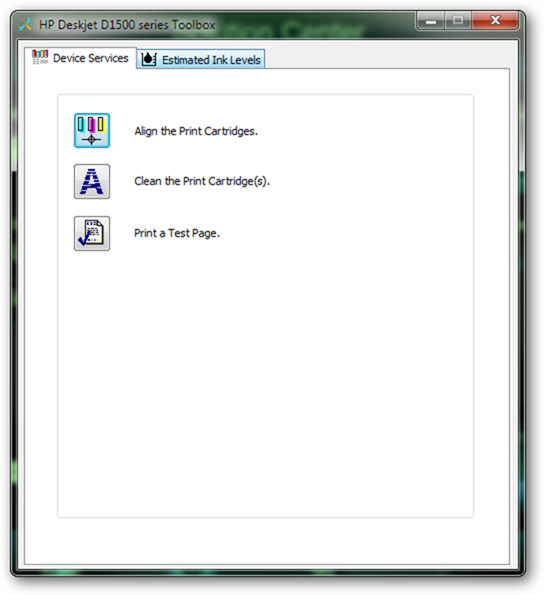 Locate your printer inside the list of devices and printers. 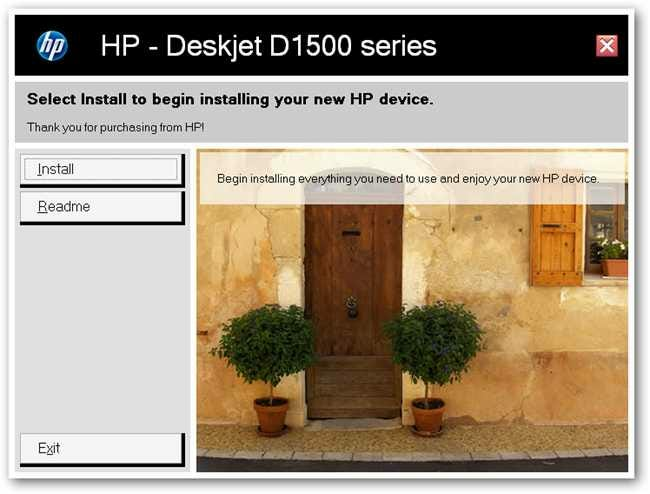 Double click it to bring up your options and tools for your installed printer. Your window may or may not look like this, depending on your brand. Regardless of your screen layout, you’ll want to find your “Maintenance” tasks, like aligning and cleaning cartridges. Align runs a printer specific wizard that will ensure that each inkwell inside your printhead is accurately printing relative to the ones next to it. Usually they are simple and involve printing a few pages of basic characters in primary colors and making a few adjustments on screen. If your printer is new or you have just installed new cartridges, chances are you could stand to align your cartridges. Clean Cartridges is another simple routine that will run your ink nozzles and printhead, clearing up microscopic dry spots that destroy image quality. Be cautious when running the Cleaning routine, as it can waste lots of ink if done repeatedly. 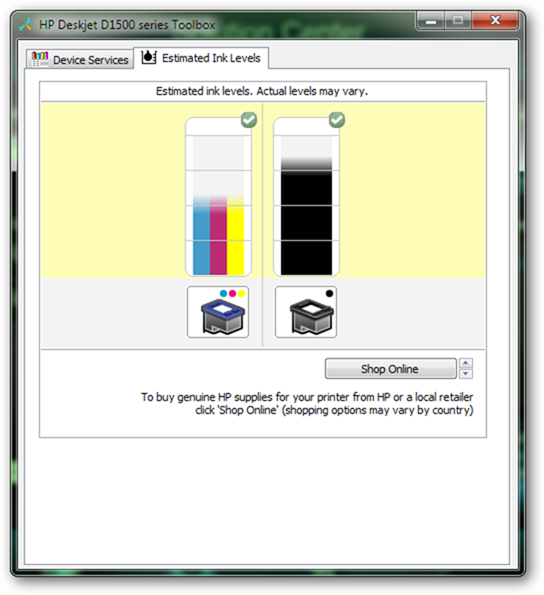 Many printers have tools for reading the current ink levels of the installed cartridges. This tool, illustrated above, plainly shows the levels of inks, but is not entirely accurate. Be aware that your ink levels may always be higher or lower than what you’re seeing on screen. 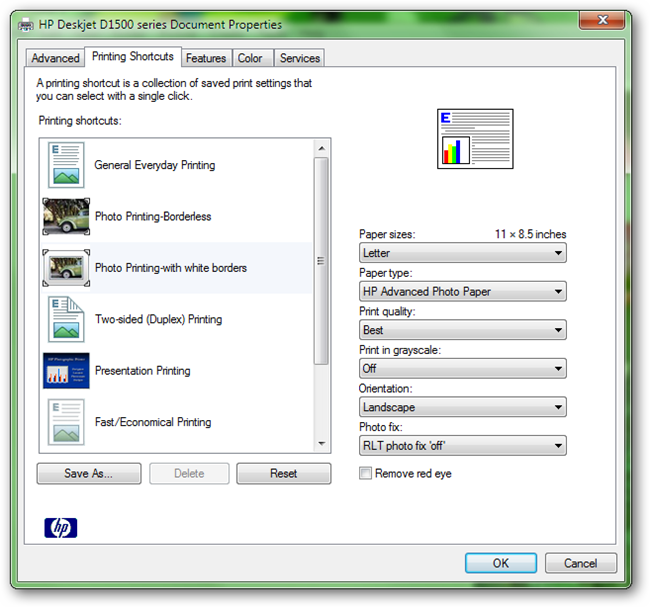 When you go to print, you’ll have dialog boxes that communicate with printer calibration and color settings. These are of paramount importance, even if they are as simplified as they appear here. You’ll want to choose settings appropriate for the paper type you’re planning to print on, as well as quality, speed, and color settings. Depending on these settings, your printer will use a varying amount of ink, or even print your image at higher or lower resolutions. 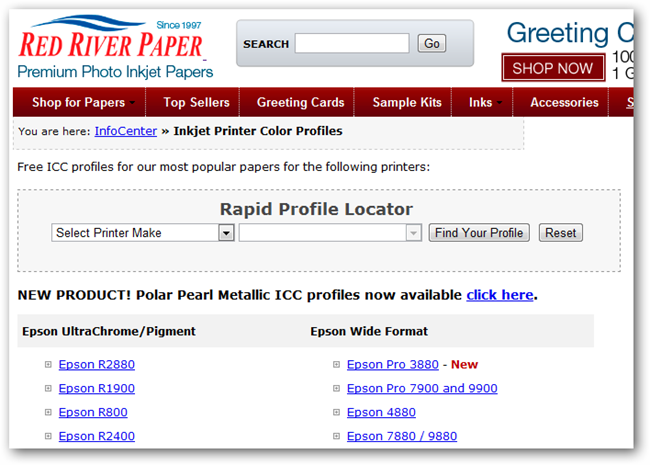 Various printers usually have profiles for their own brand of papers in an attempt to encourage users to buy the manufacturer’s brand. This can be a good idea, as these profiles are created by professionals and engineers, but they aren’t absolutely necessary. Any inkjet photo printer will work with any inkjet photo paper of comparable quality—brand barely enters into it. For those of you that are interested, there are various paper companies that sell high-grade photo and archival quality art papers for inkjet prints. Some of these, like Red River Paper or Breathing Color, offer color profiles for download, as well as detailed instructions and how-tos on their website, to help customers create prints from advanced programs like Photoshop, where there are a myriad of options available for printing. 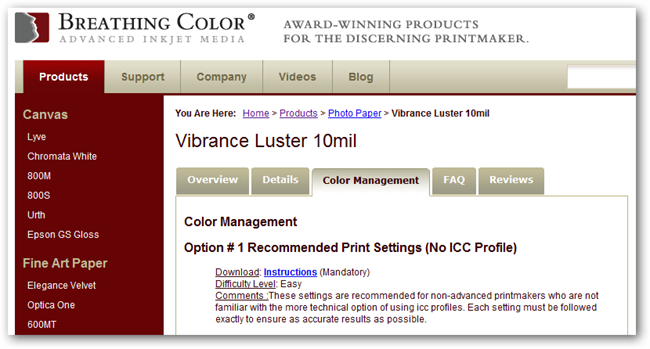 ICC Profiles are essentially a color space, or gamut (pre-selected range of colors a machine is capable of), which helps users with properly calibrated monitors get more accurate color from screen to print. These are specific not only to brands and printers, as you can see illustrated above, but also to every paper type these retailers offer. 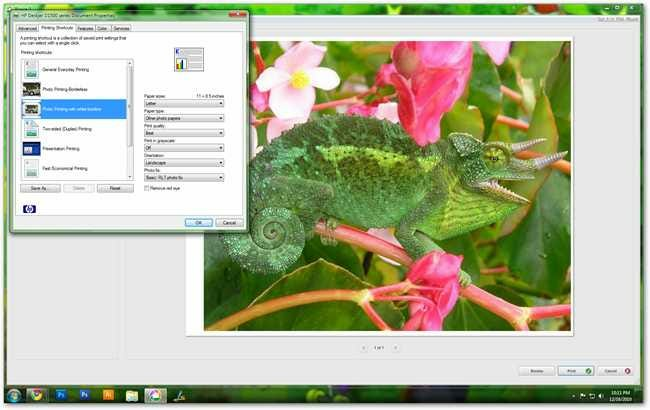 However, without an advanced art program like Photoshop, these profiles are not useful, but software as relatively inexpensive as Photoshop Elements can load and print with these profiles. Adventurous readers could choose to experiment with some higher-grade photo papers and the corresponding ICC profiles, although the majority of printers will never need them. Printing will never cease to be difficult, with the many options varying the quality of prints in often shockingly obvious ways. However, with a properly set up and maintained inkjet, readers will find it much easier to get the photo prints they want. Image Credit: Jackson’s Chameleon 2 in public domain.